Are you investing a lot of your time and efforts in Google Plus? No? Well, if you are a blogger or a internet marketer, then you should. It’s been almost three years since the launch of Google Plus (June 28, 2011) and since then, the social network of Big G is becoming increasingly popular. In fact, Google Plus is used today by several million users. It seems to have even surpassed the one billion registered users. Not only you need to have a Google+ profile, but you should also concentrate a big part of your marketing efforts in it. May be these tips will help you increase your audience and influence via this huge social network. It is essential to make your profile as complete as possible. This is even more true if you manage a company page of a brand or a small business. So be sure to add your company logo or personal photo, your basic information and your biography (which allows the reader to know you better), your work, education, contact information and your links, with your other social media profiles, your blogs and the website to which you contribute as writer. The completeness of the profile is very important, as allows users to evaluate you and understand if they want to add you in their circles or not. Do not forget that one of the main advantages of being on Google Plus is to increase your authority and influence among other users of your niche. A tip that you can consider in almost every area of the web and that is true also with Google Plus. Posting regularly will allow you to achieve greater results in terms of visibility. But be aware that the amount of the posts should be supported by an unquestionable quality. Also, be sure to share the articles of your friends you find interesting, not just your own content. The hashtag is a word or phrase (with no spaces) preceded by the # symbol – for example, #Blogging – that helps people find and participate in conversations about a given topic. The hashtags are therefore a great tool to reach a wide audience. The suggestion is to always use them in your posts on Google Plus, but without adding too many in the same posts. One is more than enough! Also, if you forget to add the hashtag in your posts, Google+ will suggest one for you. Of course be sure to check that it is in line with the topic of your share! The circles are meant to organize your contacts on Google+ according to the classification criteria you choose. They are extremely effective for your content marketing and for your personal branding. For instance, through the circles, you can share the content you post in a way similar to what happens with the tags on Facebook. Basically, you can share the content with a group of people who have the same interest of you for that information. The interaction is very important. Don’t be afraid to share other users posts, if you think it is worth. Also, give a +1 on a very useful content and leave a comment, if you have something interesting to say. Google uses Authorship to build a connection between you and the content you publish. When you set up your authorship, search results will be enhanced with your picture and Google+ profile, helping readers find your content right away and let you create influence and visibility. 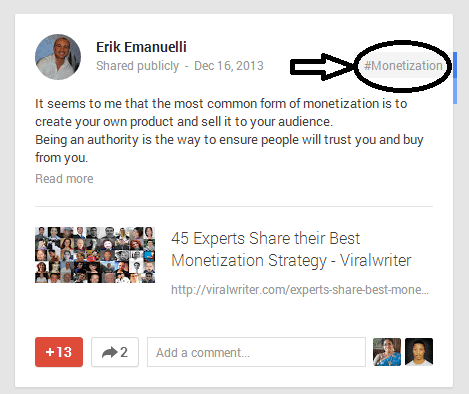 You have two options when you want to set up your Google+ Authorship. You can add in your profile the email of the domain that you contribute to (you@yoursite.com, for example) or you may link your content with your Google+ profile. If you write for several blogs, then it is suggested the last option. then, visit the Contributor to section of the About tab of your Google+ profile and add a link to your author page for each blog that you write for. After you have claimed your Authorship, your Google+ profile picture will be placed automatically next to each of your posts in the search results. You will receive definitely benefits from claiming your Google+ Authorship : enhancing your visibility in search results, creating authority for your content and getting more attention from your audience. There are many reasons why you should be present on Google+. I am sure you have already set up a great profile and you are doing a fantastic job, but if this is not your case, then I suggest you to create your profile right away and start receiving the benefits you deserve from this social network! Do not forget to let me know what you think in the comments below, thanks! Google Plus is an important social network for marketers. Leveraging on its features will help marketers get the best always. For those who wants to increase their influence and audience, it becomes important to ensure that Google Plus is utilized. This comment was left in kingged.com – the content syndication and social bookmarking website for Internet marketers where this post was shared. Thanks for sharing your feedback here. Nice share again Erik, I personally think that interacting with other bloggers and internet marketers is the best way to grab more readers. Interaction is the key to grow connections. I’ve let my interaction on Google+ slide a little over the past few weeks Erik. I tend to get sucked in much more if I spend any time there but I know it can be a great place to get traffic from. I’ll take on board the tips you’ve set out and give it another go, I think! I feel guilty too, Tim, above all for #2 or #4. I focus on something else and I sometimes forget to post regularly, or interact more with my circles. At least I can not be accused of spamming, during this time! Thanks for taking the time to read and comment, Tim! Awesome tips, Google plus is really trending social media these days and I’ve joined it and noticing lots of outcome throuhg it. 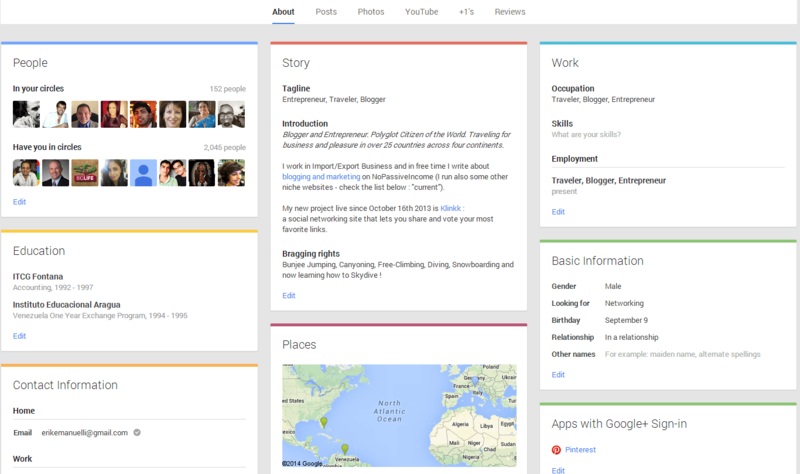 Yes, Google plus is indeed a great platform for bloggers to increase traffic to their blogs and improve influence. Like the other social networking platforms, if used the right way, it can not only bring in good referral traffic, but also help cultivate some good old influence! At first, I was not much interested in using Google +. But later, upon understanding the benefits it can offer, I embraced it! Reading this post, I can agree readily with many points and can relate to them easily. I guess the prime priority is to have a complete profile. Many folks, in a bid to get started fast, leave the profile incomplete and start off with promotion stuff. But having a complete profile has its own set of advantages. Then comes the ‘being consistent’ part. One shouldn’t just share and promote stuff for just one day and then forget about it! Consistence should be the key, I admit that fact. Then there are some handy tools that one can make use, like- Hashtags and communities. I’ve been making good use them. I found the link to this post on Kingged. I found it much useful and so will be Kingging it there. Hope that more readers over there notices it and read it! Thanks for reading and taking the time to comment, Arun. Use the Hashtag, it’s absolutely a good strategy to increase your audiences and spread your reputation effectively. I strongly recommend it and thanks so much for your valuable information Erik. Thanks for stopping by, Stephan! Hey Erik, I wish to know how many days it takes to reflect my Google+ profile in search results. I’ve done it for few of my blogs but was expecting quick results from Google. Are you sure you set up everything correctly, Glenn? It may take from 2 weeks up to months to see your face appearing in the search results, in my experience. 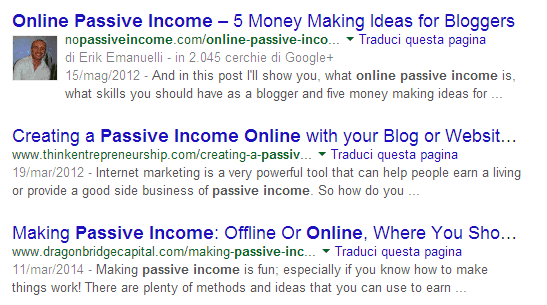 Also, it is not granted you will be featured in the SERPs, even if you set up everthing in the right way. The decision is up to Google. Just do the authorship process, and forget about it. A beautiful day you will wake up seeing your happy face in the search results. I guess it really depends on how you use Google+. It’s really a must have for any blog owner, nowadays. Above all for authorship integration, YouTube, etc. Glad you enjoyed the article, Vino. Out of all of the social media platforms out there… Google+ is actually one of the services that I have never really invested a lot of my time in. Thank you very much for the information, as I will give this a try. I never really gauged it’s potential yet. Invest some of your time on Google+ and you’ll see the benefits, John! You should implement them, Vicky! Googleplus is a great tool for all bloggers, many of us are still learning how to maximize this great tool. Google + is a must for every internet marketer! I agree with everything you pointed out here about free ways to get exposure for one’s blog. Regularly publishing high quality posts. One of the friendliest so far for getting exposure on blogs for me is by means of blog commenting and social bookmarking websites. thanks for sharing your experience here. have you already joined Klinkk? Google+ is a great social networking platform to increase traffic. Glad you liked the post, Rohit.